Motorola continues to release Android smartphones including the Z series, which is compatible with Moto Mods. The Mods are a series of accessories that attach to your smartphone using magnets and add features like a projector, speaker, or battery pack. The most recent batch includes models exclusive to Verizon in the U.S. and unlocked models compatible with AT&T and T-Mobile. In 2011 Motorola, Inc. split in two: Motorola Mobility and Motorola Solutions. Google acquired Motorola Mobility in 2012 ​which Google then sold it to Lenovo in 2014. The Z series smartphones are nearly stock Android with a bit of Moto customization thrown in and compete well with flagship phones from Google and Samsung. Here's a look at what's next for Motorola and notable recent releases. The Moto Z3 (Verizon exclusive) and Z3 Play (unlocked) are very similar smartphones, the main difference being carrier compatibility, and price. The biggest difference is that the Z3 is 5G-ready, meaning it can connect to Verizon's 5G network when it launches. Both smartphones are compatible with Moto Mods, have microSD card slots, and lack headphones jacks. The phones also have side-mounted fingerprint sensors, underneath the volume buttons. The Z3 comes in a 64 GB configuration, while the Z3 Play has 32 GB, 64 GB, and 128 GB versions. The Z2 Force is an incremental update to the Z2 Force; the two smartphones are very much alike. The biggest upgrades are the processor, camera, a redesigned fingerprint scanner, and an available update to Android 8.0 Oreo. It also has more carrier support in the U.S. than the Z Force did. The fingerprint sensor is a bit larger than the Z Force's, and it responds better to gesture controls that enable the scanner to act as a home, back, and current apps key. It can also put the phone back to sleep. The Z2 Force has two 12-megapixel cameras on the back, which produces higher-quality photos than a single lens; the secondary sensor shoots in monochrome so you can get black-and-white snaps. It also helps you create bokeh, an effect in which part of the photo is in focus while the background is blurred out. The selfie camera has an LED flash for well-lit self-portraits. Otherwise, the Z2 Force is just like the Z Force. It features the same ShatterShield technology that protects it from everyday drops and bumps, though the bezel is prone to scratches. It only has a single speaker embedded in the earpiece; to get better sound, you might consider the JBL SoundBoost Moto Mod. Both smartphones are also Google Daydream compatible, which requires Quad HD. Neither of the Force smartphones has a headphone jack but come with a USB-C adaptor. Both have microSD card slots. The Moto Z2 Play breaks with Motorola tradition and gives both the Verizon and unlocked version the same name, rather than tacking on Droid to the end of the Verizon version. The Z2 Play adds a variety of voice commands, including "OK Google," which wakes up the phone and launches the Google Assistant, and "show me," which you can use to summon weather information and launch apps. The "show me" commands work even when the phone is locked. These commands only work with your voice, for security's sake. The fingerprint scanner works as a home button, unlike previous models, and responds to gestures to go back and show recent apps. This design is an improvement as many reviewers mistook the scanner for the home button on older smartphones, but the gestures can sometimes be challenging to execute. The metal back is compatible with Moto Mods. Its battery life isn't as impressive as the Z Force phones, but that can be improved by attaching TurboPower Pack Moto Mod. It also has a headphone jack, which the Z Force models lack as well as a microSD slot. The Moto Z Force Droid is a high-end smartphone exclusive to Verizon with a rugged display protected by Shattershield technology and a metal finish on the back. You'll find many pre-installed Verizon apps on this smartphone as well as smart gestures from Motorola including a karate chop motion that turns on the flashlight. Because of the available Moto Mods that attach to the back of the phone, the fingerprint scanner is on the front, just below the home button. Mods include a JBL SoundBoost speaker and a Moto Insta-Share Projector. Like many high-end smartphones, the Z Force Droid lacks a headphone jack but comes with a USB-C adapter. It also has a microSD card slot. The camera, which you can launch with a twisting gesture has optical image stabilization to combat blurry photos. 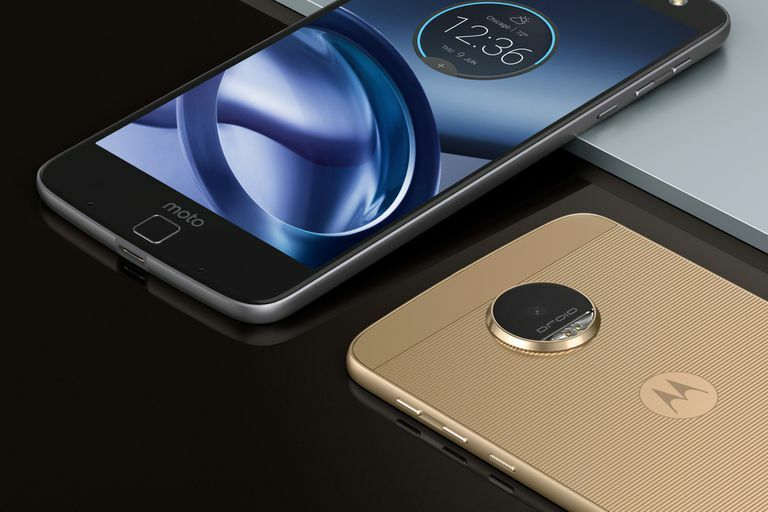 The Moto Z Play Droid (Verizon) and the Moto Z Play (unlocked) are mid-range devices in contrast to the Moto Z and Z Force smartphones, which are faster and lighter. The added bulk is due to a larger battery that Lenovo (which owns Motorola) says will last for up to 50 hours on a single charge. The smartphones also retain the much-loved-by-many headphone jack that new models often eschew. The Z Play models also lack the ShatterShield display featured on the Z and Z Force phones, and its back is glass rather than metal. Another difference is that the Z Play cameras lack optical image stabilization to compensate for shaky hands. Like other smartphones in the Z series, it's easy to mistake the fingerprint scanner for a home button. While the Verizon version comes jammed with bloatware, the unlocked version (AT&T and T-Mobile) has only a few Motorola add-ons, including a series of gestures and a one-handed mode. Smart gestures include a Star Wars inspired Jedi move in which you wave your hand over the smartphone's face to light it up and show your notifications and the time. Both models have microSD card slots for extra storage. The Moto Z and Moto Z Droid share the same specs, but the Z is unlocked, while the Z Droid is exclusive to Verizon. At the time these phones were released in mid-2016, they were the world's thinnest phones at 5.19mm thick. These smartphones were the first to be compatible with Moto Mods, which magnetically attach to the device, and add features, such as a higher-end speaker. The fingerprint sensor is on the front of the phone so as not to interfere with the Moto Mods. It is easy to mistake it for the home button, at least at first, though, which is located just above it on the screen. These smartphones lack a headphone jack but come with a USB-C adaptor for your headphones. They are also Google Daydream compatible. The Moto Z and Z Droid come in 32 GB and 64 GB configurations and can accept microSD cards up to 2TB (once such cards exist).